Removing prior O365 C2C V1 agent? Is it possible to remove the prior O365 Cloud-to-Cloud agent that was installed prior to the 7.8 update? Our account currently has both, and I don't see an option to remove the V1 agent, which is the older one. In return, I cannot seem to login to it following the installation of the new C2C. After you configure the new cloud-to-cloud backup, delete backup plans for the previous version to stop backup jobs and, in the case of per-device pricing, avoid billing for the previous backup installation. 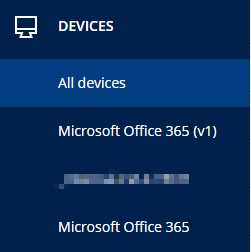 Go to the Devices -> Microsoft Office 365 V1 tab and delete the backup plans applied to the items. Only if you want to keep your old Office 365 backup archives and be able to recover Office 365 data using them: After you disable the C2C 1.0 backup plans, your Office 365 archives are not affected. It’s your choice how long to keep them in cloud storage. But please note that you will still be billed for the Acronis cloud storage these backups occupy. To be able to perform a future recovery using these backups, you need to keep the C2C 1.0 agent installed in Acronis data center. Delete old backup archives in the Backups tab. Create a support ticket that contains the C2C 1.0 agent deletion request.